A few weeks ago a startup asked me to figure out the cheapest and most sustainable way for them to get 25 qualified leads to try their product. Like most startups they did not have a big budget for marketing experiments and needed to bootstrap to get some initial customers in the door. 24 hours later I generated 60 qualified leads for them using nothing but a simple landing page and a LinkedIn group. This process was so successful that they decided to repeat the experiment again. I’ve done this many times and it works like a charm every time. Here is a step by step of how I did it. There are billions of articles and books on the importance of defining your target market. I’m not going to give you a lecture on how to define your target market. I will say that for this technique which I’m about to outline you have to know exactly what type of people you want as leads. In my situation above it was CIOs of enterprise on-demand companies. Some examples would be CIOs at Verizon, Comcast, Merry Maids, Home Depot, Geek Squad, etc. In your case it’s whoever you think your customer is. Not too long ago I wrote an article titled ‘How I Sold My App to 10 People Before I Wrote a Line of Code and Then Launched It’. In the article I share how I pitched my app idea to tons of different types of people to see who would actually pay for it. The goal was to get 10 people to pay me money before I start work on it. I ended up getting those 10 people to pay me and that’s how I knew who my target market really was before I started building the app. That’s just one way to do it. There are millions of other ways to do this, which I will not delve into now. So as mentioned: know who your target market is. As I said my target market for this example above was CIOs of on-demand enterprise companies. You need to find the largest and most active group there is on LinkedIn or Facebook for your target market. Notice the underline on ‘most active’. There are tons of groups which consist of a bunch of robots. You need to find the biggest and most active group for your target market. Become a member of the group and test it out. Post some updates yourself, get a feel of the discussions which are added and how people respond to them. Get familiar with the group overall. Make sure this group has the types of people you want to have as leads. 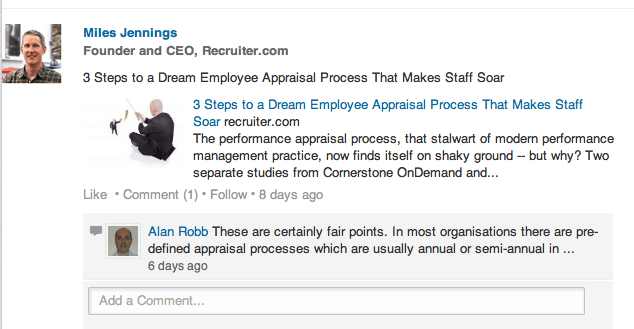 Now find an old piece of content written by yourself or your team or write a new piece of content. This content must really engage the people in your target group. I’m talking about something that stirs folks up, gets them to reply and upvote and read at least 80% of what you’ve written. 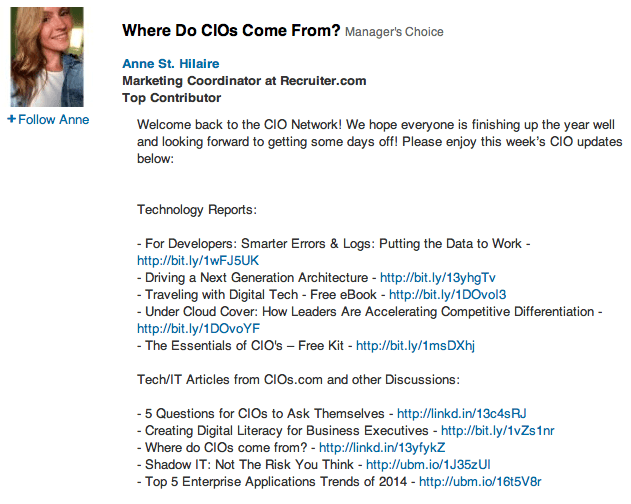 See how this article speaks directly at CIOs about something they are all facing today? This grabs them and pulls them in, exactly what I’m trying to achieve. Not too long ago my friends from BuzzSumo wrote an article titled: ‘Why Content Goes Viral: What Analyzing 100 Million Articles Taught Us’ where they report on what types of titles get most social media shares and why. I suggest checking that article out as you come up with your title. So in short you need to have a killer piece of content for your audience. Want examples? Go to BuzzSumo and type in the keyword for your target market, you’ll find the most shared pieces of content. Got your piece of content written and published? Ok, let’s collect some leads! This step is pretty straight forward, create a downloadable PDF out of your article. Format it nicely with your company bio or info all the way at the end of the whitepaper. I ended up turning the LinkedIn article into this PDF. The PDF is pretty basic, see how there is some information about the company towards the end? That is really the only thing you need to add to it. Take out any dates associated with the article. You do not want your readers to know that it was an old piece of content or written and published somewhere else. Check out the live page here. The page showed the very beginning of the article and asked the visitor to put their email address in to get the full PDF of the whitepaper. There is an article out there titled: Proof of Heaven, Propaganda and Feeding Your Audience Exactly the Meal They Asked For by Joanna Wiebe of Copy Hackers which is a gold mine when writing copy for pages such as this one. Read it, it has awesome tips in it on how to make this copy as best as possible. I know people are going to ask so I’ll just say it, I used Unbounce to make this page above. However I’m a huge supporter of LeadPages as well. Both are awesome products and you can make a page like the one I made above in 5 minutes with either product. 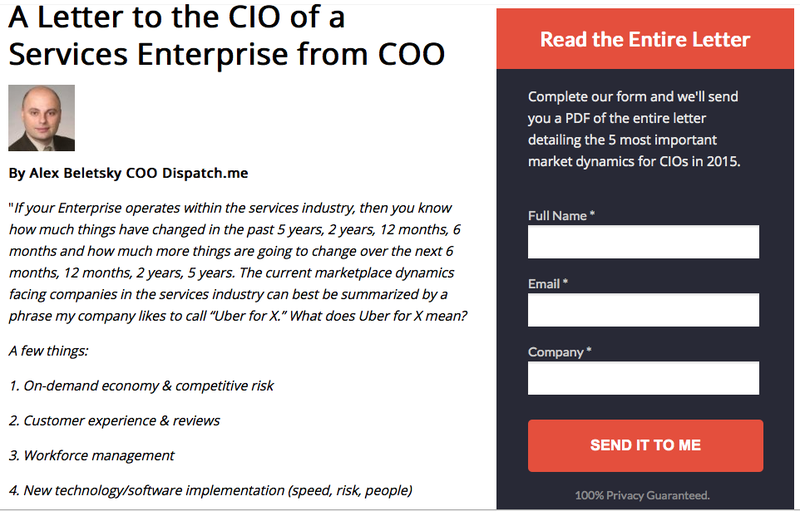 Thanks for downloading my letter titled “A Letter to the CIO of a Services Enterprise from COO”. To access the PDF just click on the link below. I hope you enjoy this content! I’d love to hear your feedback and thoughts on the 5 most important market dynamics for the technology leaders in 2015 I talk about in the letter. Just make sure this email is working well. Test your landing page out. Now you are ready to get traffic to your landing page from the group you identified. The idea is to get emails of leads who are interested in your content. Once they sign up to get the PDF you can follow up after and try to sell them (more on that later). 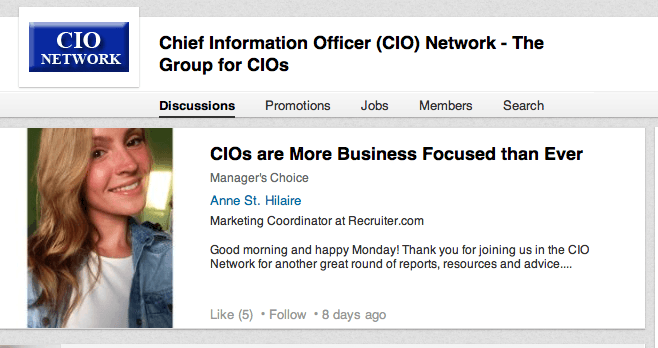 I’m a member of your LinkedIn group and recently came across one of your articles on your blog about the changing environment for CIOs. I really enjoyed the article. I’m currently in process of writing a guest article for CIO.com and wanted to see if I could interview you for the article. Your group and company would get good exposure form it. I have another opportunity to publish a similar interview on CIO-Today. Let me know if you’d be interested. Now I wait until the owner responds. The idea is that you scratch their back and they scratch yours. You interview them and promote the interview to three different sources which are well known. It can be three slightly different interviews. Most of the time the owner of the biggest LinkedIn or Facebook group for your target demographic is some type of expert or at least well regarded in the field for what they do. So getting an interview published with them in a targeted publication should not be that hard. In return ask for a direct email blast of the group but an update is also acceptable. Never hurts to ask for an direct email blast of course. If it’s an email blast you’ll need to do more copy editing to make sure the email speaks to your recipients. Come back to that article ‘Proof of Heaven, Propaganda and Feeding Your Audience Exactly the Meal They Asked For’ by Joanna Wiebe, it will help you craft this email. Here is an article titled How I grew my Startup to $40K Using Emails and Good Content detailing the complete procedure and how you go about accomplishing this. Remember to make sure the group owner promotes the landing page you created. Unbounce or whatever service you use keeps tracks of the leads. You can integrate it with Salesforce if you like. You have about 5 days until your leads become completely cold and forget all about you. So you want to follow up and ask how they liked your PDF within 5 days. Also remember it takes about 5 follow ups to close a deal. A very good friend Saph runs a site helping people write better email copy, I suggest you take a look at this section on sales follow up emails to make sure you’re effectively following up. (Insert Your Name) here from (Company Name). Alex mentioned that you just expressed interest in his ‘Letter to the CIO of a Services Enterprise from the COO.’ I wanted to follow up and make sure you received the PDF in the email OK.
That is it! Give it a try. I’d love to hear your feedback and comments as you get going with this approach. If you want to get some quick qualified leads you do not need fancy ad campaigns and you most certainly do not need to spend a lot of money. A targeted piece of content toward a popular and targeted LinkedIn of Facebook group will do wonders in terms of generating leads.